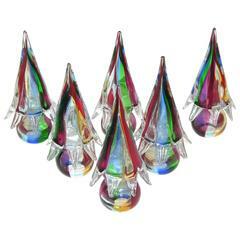 This piece is a unique 1980s Formia art glass head sculpture piece, of modernist dynamic design. The crystal clear face in blown Murano glass is worked with diffused amber and aquamarine blue tints to give depth and texture, decorated with vivid blue eyes and red lips in relief. 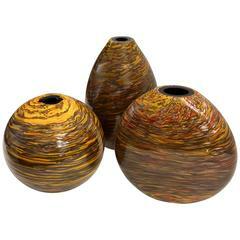 The hair in gray Murano glass surrounding the face is worked with reddish brown highlights for a realistic impression. This production has been very limited, each piece individually crafted so that each head is different and has a unique expression. It makes a true conversation piece. 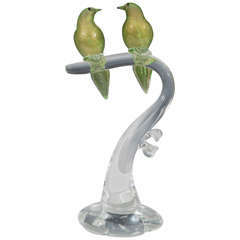 A Venetian sculptural duck figurine in handblown glass, produced on the isle of Murano, circa 1980s. It was made by Formia, Vetri di Murano. A nice piece of art for any room. A Venetian sculptural fish figurine in hand blown glass, produced on the isle of Murano, circa 1980s. It was made by Formia, Vetri di Murano. A nice piece of art for any room. 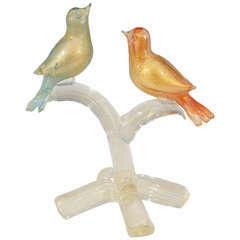 A vintage Formia Murano glass sculpture of a blue and orange gold infused cased birds on a tree branch.